Meet the Mountain Gorillas on this 12 day trip by tracking them in the deep tropical forests of Rwanda and Uganda. Cruise along the Kazinga Channel while also spotting tree climbing Lions in Ishasha. Trek up the Muhavura and Gahinga volcanoes. Take home memories of the captivating Gorillas and much more! Arrive at Kigali International Airport and transfer to hotel. Kigali, the capital city of Rwanda is the largest in the country. Well connected by air to many international cities, it is the cultural, economic and political capital of the country. Get briefed about your gorilla tour and embark on your adventure to Gorilla territory as you depart for Parc National des Volcans (PNV). Parc National des Volcans (Volcanoes National Park) is prime Gorilla country. The unique geography of the park comprises five of the eight volcanoes of the Virunga Mountains (Karisimbi, Bisoke, Muhabura, Gahinga and Sabyinyo). Situated in Rwanda, it was the first National Park to be created in Africa in 1925. The park is home to the endangered Mountain Gorilla and other mammals like Golden Monkey (Cercopithecus mitis kandti), Black-fronted Duiker (Cephalophus niger), Buffalo (Syncerus caffer), Spotted Hyena (Crocuta crocuta) and Bushbuck (Tragelaphus scriptus). The park is inhabited by more than 178 species of birds of which around 13 are endemic to the region. The journey up north traverses beautiful terraced hills and fields. As the elevation increases, the volcanoes loom on the horizon, with a view of all five of them from certain points. The temperature is much below normal for tropical countries, as the region is at high elevations. 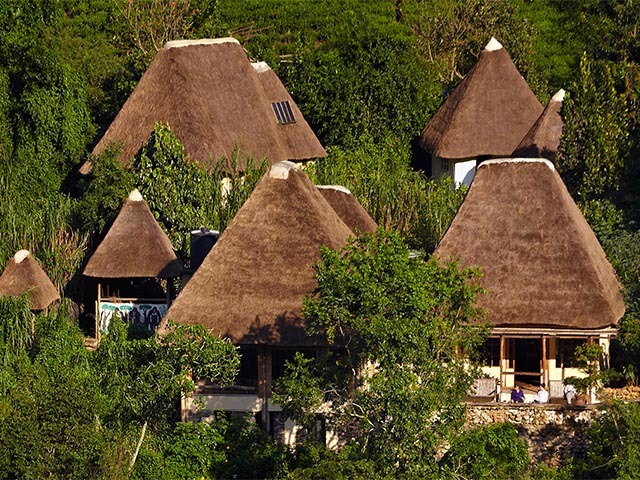 Stay at the Virunga Safari Lodge, an exquisite eco-friendly lodge set on a hill ridge watching over the Virunga Volcanoes. Watch over Lake Ruhondo and Bulera and relax in the serenity of the lodge. Meet a few of the last Mountain Gorillas in Volcanoes National Park. Mountain Gorillas are a subspecies of the Eastern Gorillas and are found in only two populations – in Virunga volcanic mountains in Central Africa and in Bwindi Impenetrable National Park. They are endangered and only around 700 Gorillas survive in the wild. Close relatives of Humans, these Gorillas are social animals and are found in groups of one adult male, several female and children. The adult male known as the 'silverback', is integral to the group survival as he guides it through the forest. The Gorillas are diurnal and are usually active from sunrise to sunset and rest in nests at night. Track Gorillas through the thick bamboo forest and slushy mud. The search for Gorillas is made easier by trackers who accompany the Gorilla family every day. Gorillas are foragers and travel extensively throughout the day, tracking them depends on a lot of factors. If you are lucky you might not have to trek a lot, and will chance upon them very soon! Spend an hour with these beautiful creatures. 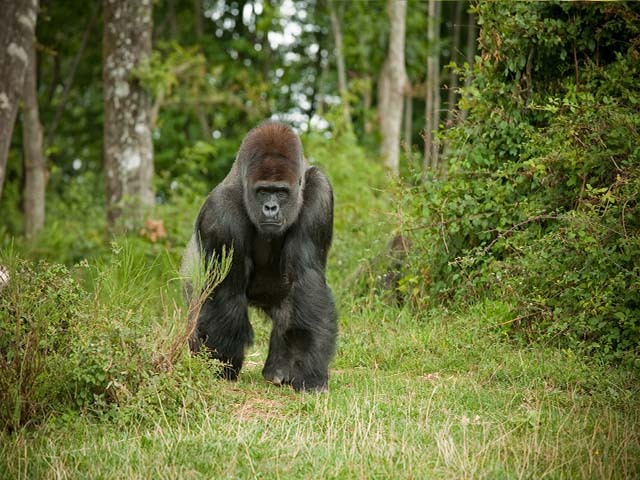 Gorilla tracking can take any number of hours, while photographing and sighting them is allowed only for an hour. One Permit allows for one Gorilla trek, and there are no refunds or guarantees for Gorilla sighting. Go Gorilla Tracking again today in Volcanoes National Park (subject to prior booking of permit) or visit the Golden Monkeys. These are old world monkeys inhabiting the highland forest region. Highly endangered these monkeys are identified by the golden patch on their backs. Moving around in groups of up to 30 individuals, they forage the trees for food and are extremely agile. Relax on the shore of Lake Kivu in Gisenyi as an alternate plan. Lake Kivu is one of the great lakes of Africa, and Gisenyi is a resort town on its shores. Indulge in water sports or simply sunbathe on the beach. Also visit the Rosamand Carr’s Imbabazi Orphanage for kids. Otherwise, trek to Dian Foseey’s grave. She was the pioneer for research on Mountain Gorillas and has been accredited with bringing up the cause of conservation of these creatures to the limelight. She is buried at Karisoke among other Gorillas, and there is a simple memorial marking her grave. The trek is slightly difficult and you will be accompanied by armed guards. Alternatively, climb up the Visoke/Muhavura volcanoes. They are volcanoes belonging to the chain of Virunga Mountains. Or walk to Lake Bulera. Choose from any of the exciting options on offer to spend the day. Relax or explore the surroundings in the lodge. Visit Golden Monkeys or trek to Dian Foessy’s grave. After a packed morning we leave from Volcanoes National Park after lunch and depart for Mgahinga Gorilla National Park in Uganda (Clocks go forward an hour). Mgahinga National Park is located in Uganda and is one of the two places where Gorillas are found, the other being Bwindi. It is contiguous with the Volcanoes National Park in Rwanda and covers three volcanoes in the Virunga range - Mount Muhabura, Mount Gahinga and Mount Sabyinyo. An important habitat for Mountain Gorillas, it also supports a wide variety of wildlife. Check-in at the Mount Gahinga Lodge nestled in the foothills of the volcanoes. Overlooking the volcanoes, the Lodge provides spectacular views on all sides. Today track Mountain Gorillas in the rainforest. Since the national park territory is small, Gorillas often move over to Rwanda and it gets difficult to track them. This region though is great for bird watching and partaking in a bewitching rainforest experience. The national park has more than 79 species of birds. As an alternate plan, visit the Gahinga volcano. Mount Gahinga meaning ‘a pile of stones’ is an extinct volcano and the ecology is a perfect example of bamboo forest. On the summit is a swamp, which was previously a lake. Otherwise, trek up the Mt. Muhavura. This tall cone-shaped mountain can be seen from all over the region. The vegetation along the way consists of grasses and shrubs on a rocky surface. After a hike of about 8 kilometers, one reaches the summit and is awarded with a brilliant landscape of the Virunga volcanoes, Lake Edward and the peaks of Rwenzori Mountain. Relax at the lodge after a long and exciting day outdoors, and share stories of Gorilla treks over dinner with fellow guests. Set out for Bwindi Impenetrable National park from Mgahinga. The road leading up to Bwindi cuts across several hills and valleys, with breathtaking scenery. The volcanoes looming in the background, with stretches of lake view offer great opportunities for photography. Bwindi Impenetrable National Park is synonymous with Mountain Gorillas. One of the last refuges of the majestic animal, the national park is also home to a wide variety of flora and fauna. The park is inhabited by 120 species of mammals, 346 species of birds, 202 butterfly species, 27 species of frogs, chameleons and geckos. Covering more than 331 square kilometers in area, the park is a UNESCO World Heritage Site and a sanctuary for the Colobus Monkeys, Chimpanzees and Mountain Gorillas. Check-in at the Volcanoes Bwindi Lodge. 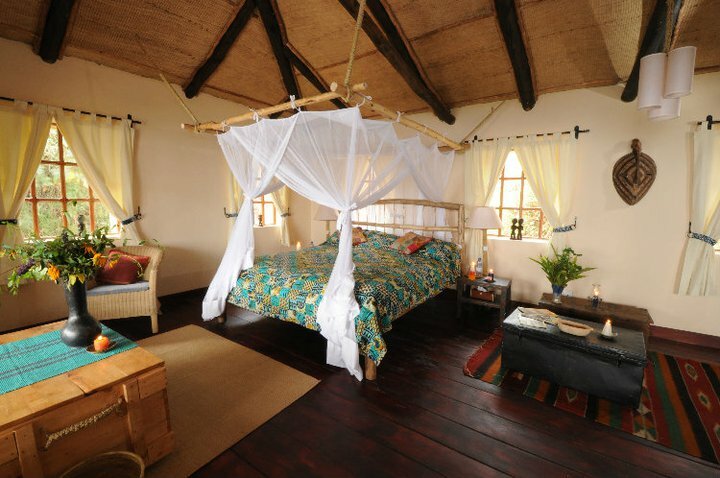 This eco-friendly lodge has taken its environmentally friendly initiatives earnestly, so much so that the Gorillas feel at home and even nest in the Lodge area. The carefully nurtured regenerated bush which acts as a buffer zone is beautiful to walk through to the river. Relax in the Lodge and keep a look out for the monkeys and birds by the river, or go for a community walk. Mountain Gorillas, the gentle giants are highly endangered and are found only in two populations in the world, in Virunga Mountains and in Bwindi National Park. Gorilla tracking in Bwindi can be a tough task, as the terrain is mountainous. Though tracking a group can take any amount of time, the time to photograph and observe the Gorillas is limited to only one hour. Experience the breathtaking moment of coming face to face with a Gorilla! Look into its emotive eyes and connect with the animal, with whom you share 95% of your DNA! Instead of the Gorilla trek, go on a forest trek and walk through the forest which has survived even the ice age. The tropical forest has many wonders hidden, the interesting insect life, spectacular birds and amazing mammals. Wind up at the lodge after an exciting day spent in the forest and swap stories with fellow guests on the terrace. Travel from Bwindi Impenetrable National Park to Queen Elizabeth National Park in western Uganda. The park set up in 1954, is a biodiversity hotspot due to its diverse eco-systems ranging from open savannah, rainforest, swamps to crater lakes. It has several habitats that are home to endemic species like the Ishasha sector where the tree-climbing Lions are found. These Lions are distinguished by their black manes. The other habitats which support endangered species are the Kyambura Gorge which is home to Chimpanzees, the lakes where Flamingos flock in huge numbers and Maramagambo forest that is home to a wide variety of monkeys and birds. There are more than 100 mammal species and 606 bird species. It has the highest number of species, more than any other national park in Africa. The water bodies which include lakes and the Kazinga Channel are ideal habitat for water birds like Shoebill, African Fish Eagle, Martial Eagle, Papyrus Gonolek, Swamp Flycatcher and Grey-headed Kingfisher. The other common birds are Temminck’s Courser, Collared Pratincole and Red-capped Lark. Arrive at the Mweya Safari Lodge, situated in the heart of the National Park overlooking the Kazinga Channel. If time permits, go on a evening game drive in the park. Start the day with an early morning game drive. The park is a bird watchers paradise and photographers have umpteen opportunities to sight and capture the amazing birdlife. There are a lot of mammals like Lions, Elephants, Buffalo and many more to sight in this beautiful landscape. Rest during the heat of the day and venture out into the park again for an evening game drive. The animal sightings highly vary according to the season, though the Kasenyi plains generally offer good sightings of Lions while you spot several other animals in the Mweya peninsula. Today meet another great ape, the Chimpanzee! Kyambura Gorge is home to a group of habituated chimpanzees, that is they are familiar with humans and are not intimidated by them. Chimpanzees are usually found in groups of 40-60 individuals and are active from sunrise to sunset, while nesting at night. 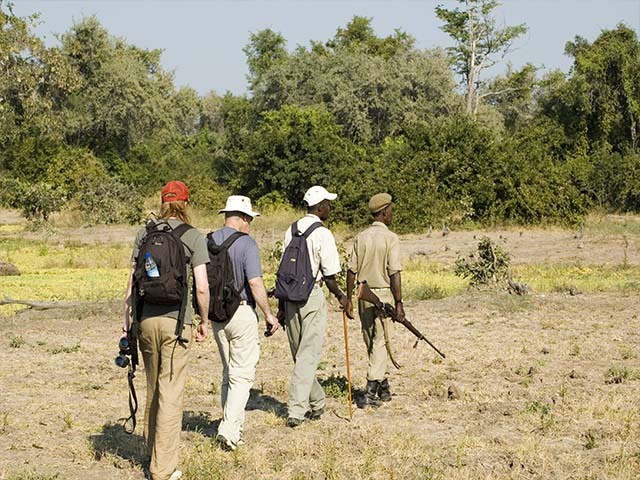 Tracking Chimpanzees and observing them is quite a task as they are very mobile and it is highly unpredictable. A walk through the jungle will take you across the enchanting forest and allow you to sight birds and insect life. Opt for a walk into the Maragambo Forest which is inhabited by several species of monkeys and birds. Trek to the Blue Lake and the Hunters cave, where you may chance upon a python among the crevices of the cave hunting for bats. Cruise along the Kazinga Channel in the afternoon. Kazinga Channel is a 32 kilometer long channel connecting Lake Edward and Lake George; it is home to Hippopotamuses and Nile Crocodiles. Several aquatic birds are found here such as the African Fish Eagle, Martial Eagle, Papyrus Gonolek, African Skimmer and many more. Bid farewell to Queen Elizabeth National Park and depart for Kampala, the capital city of Uganda. It is the largest city in the country and was historically set up by the King of Uganda as a hunting ground. Stand on the Equator as you pass through Kampala, bargain at the roadside markets and watch the royal drum makers. Drums are a popular musical instrument in Uganda and used for several purposes like religious and healing rituals, dances and communication. Freshen up in day rooms at Windsor Lake Victoris Hotel in Entebbe until transfer to the airport for return flight.